“Owner on main, top and bottom run as AIRBNB $92,500 in 2017. Can be purchased with AIRBNB furnishings.” the MLS listing for the property on the 1000 block of E 12TH Avenue read before it was taken down following the sale. 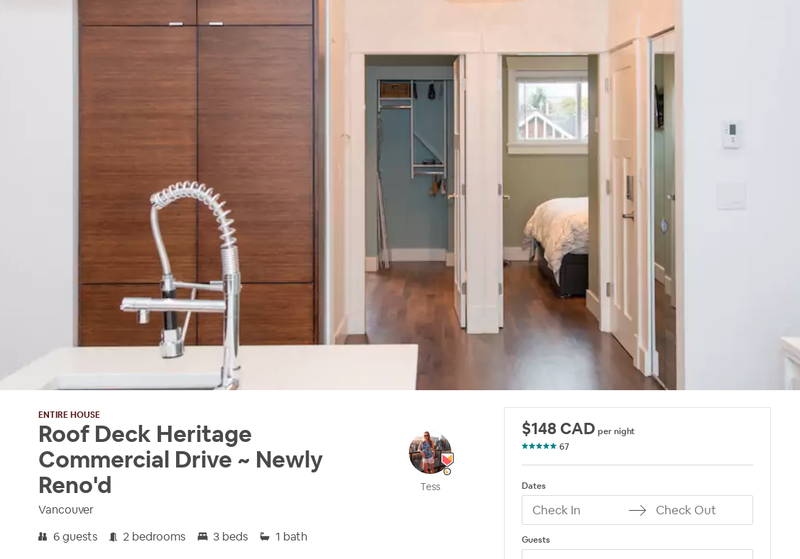 The top unit is still listed as “Roof Deck Heritage Commercial Drive ~ Newly Reno’d” on Airbnb at the rate of $148 CAD per night. The bottom unit is advertised as “Spa Bath! Character Home ~ New Reno” for $99 CAD per night . The seller is a “superhost” who goes by the name of “Tess” on Airbnb. Under the bylaws in place in Vancouver in 2017, homeowners were not allowed to offer entire units as short term rentals. Even under the new laws that came into force on April 19, secondary suits and multiple unit rentals by a single host is prohibited.